When compared to global heating schemes used to date, which are energy-intensive and slow, light-controlled heating which uses optical degrees of freedom such as polarization, light wavelength, and power enables local, efficient, and quick heating methods to be executed for use in nanomagnetic computation or to measure collective developing phenomena in artificial spin systems. The main metamaterials for low-power information processing, for magnetic data storage devices, and to examine collective phenomena in so-called artificial ices are the single-domain nanoscale magnets interacting through contactless magneto-static interactions. These magnetic metamaterials are produced using electron-beam nano-lithography, where any needed two-dimensional arrangement of thin-film magnetic elements with dimensions of a few hundred nanometers can be developed. The functionality of such magnetic metamaterials is decided by the ability to reverse the net moment of each nanomagnet to reduce the overall mutual magnetostatic interactions, which occurs more rapidly at high temperatures. In recent years, various heating schemes have been used to power networks of interacting nanomagnets to an equilibrium state, ranging from thermal annealing of stable magnets to the fabrication of fast-fluctuating ultrathin superparamagnetic elements. Currently, thermal excitation of artificial spin systems is attained by thermal contact to a hot reservoir, either by heating the whole underlying substrate or by an electrical current in a neighboring conductive wire. All these methods are spatially non-discriminative, energetically inefficient, and inherently slow, with time scales of seconds to hours, rendering it difficult to achieve a proper equilibrium state in extended disturbed nanomagnetic lattices. Moreover, for execution in devices of magnetic metamaterials, such as nanomagnetic logic circuits and magnonic crystals, global heating does not have the control, spatial discrimination, and speed needed for integrated operation with CMOS technology. In this research, the scientists apply a hybrid method that integrates a plasmonic nanoheater with a magnetic element and establish the robust and reliable control of local temperatures in nanomagnetic arrays by contactless optical modes. In this case, plasmon-assisted photo-heating enables temperature increases of up to several hundred Kelvins, which result in thermally activated moment reversals and a prominent decrease in the magnetic coercive field. Moreover, the polarization-dependent absorption cross-section of elongated plasmonic elements allows sublattice-specific heating on sub-nanosecond time scales, which cannot be carried out using traditional heating schemes. The scientists experimentally measure the magnetic and optical properties of a series of single hybrid elements as well as vertex-like assemblies, and exhibit approaches on how to attain quick, efficient, and selective control of the thermally activated magnetic reversal by choice of pump power, focal point, pulse duration, and light polarization. 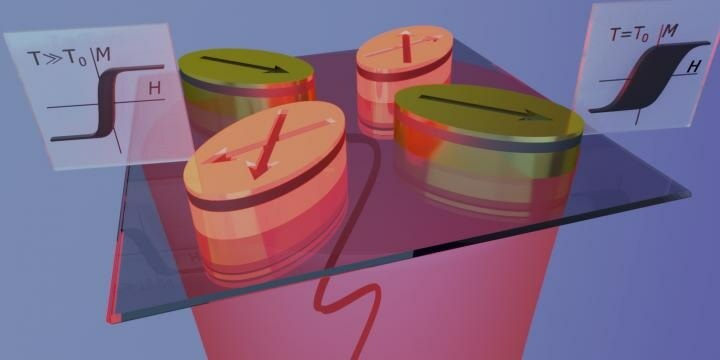 Thus, the growth of efficient non-invasive plasmon-assisted optical heating of nanomagnets enables flexible control of time scales and length of the thermal excitation in magnetic metamaterials. This allows in-depth investigations of equilibrium properties and developing excitations in artificial spin systems, and also paves the way for practical use in applications like low-power nanomagnetic computation. This research was supported by the Ministerio de Economía y Competitividad under the Maria de Maeztu Units of Excellence Programme – MDM-2016-0618 and the Project FIS2015-64519-R, as well as by the European Commission under the Project H2020-FETOPEN-01-2016-2017 “FEMTOTERABYTE” (project no. 737093).